SSD-like speed in an instant? The world and its wife, and possibly their dog too, knows that if you want blistering storage drive performance then solid-state is the way to go, and if you want capacity then the good old clanky mechanical hard drive is your friend. Wouldn't it be great if you could somehow combine the two? 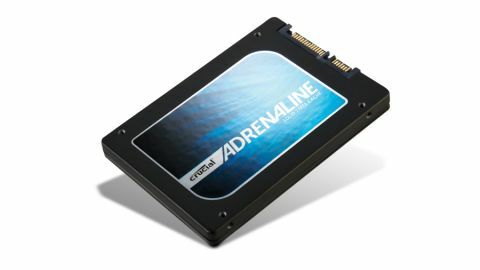 Well, Crucial's latest effort, the 50GB Adrenaline Solid State Cache Drive, aims to do just that. Using Dataplex software, the Adrenaline drive caches the most frequently used active data files and leaves the less commonly used ones on the HDD. That means faster boot times, and faster load times for your most frequently used applications. Best of all, you can add the cache drive to a system without touching anything on the original drive. There's no formatting or partitioning needed - the only requirement is that the existing drive is running Windows 7. Installing the Adrenaline is very straightforward - just connect it to a SATA 6Gbps port on your motherboard, register the drive online at Crucial's website and download the Dataplex software. Once installed, the software can be found in the Start menu. Clicking on the icon opens a pop-up window that tells you whether Dataplex is enabled or not. The big benefit of the Adrenaline is that you can use it with a standard mechanical hard drive without losing any of the data stored on it. Indeed, the primary drive actually needs to contain a Windows 7 installation. To prove the point, we combined the Adrenaline with a veteran Seagate drive that has been used in many a test rig, along with a Windows 7 installation with a heap of benchmarks and other software on it. Just adding the cache drive resulted in some impressive performance figures. The combination of drives knocked a stunning 16 seconds off the boot time of the Seagate drive on its own, while the results gleaned from the storage benchmarking suites PCMark Vantage and PCMark 07 were something to behold. We took the opportunity to test the Adrenaline drive as a straight forward boot drive to give us a feel for its performance as well as testing it in is intended role as a cache drive to supplement a standard mechanical hard drive. In this case that HDD was a well-used 320GB Seagate Barracuda 7200.10 with a standard SATA 3Gbps interface. Internally, the Adrenaline uses a Marvell 88SS9174-BLD2 controller, while the 50GB capacity is made up of eight 8GB Micron 25nm MLC NAND chips. Yes, we know that makes 64GB, but 14GB of space is provisioned for performance optimisation. Crucial provides everything you need to get the drive installed, with a 3.5-inch drive bay converter and a SATA 6Gbps cable included. The Adrenaline drive was easy to set up and use, and certainly boosted the performance of our standard mechanical drive - especially when it came to boot times. If you want the performance of an SSD without the hassle of reinstalling your software then it's certainly worth looking at. But - and it's a fairly major but - in the last month or so the price of medium capacity SSDs has begun to fall. Indeed, it's dropped so much that you can buy a high performance 120GB drive for under £100. That's below the magical £1 per GB mark, and does lessen the appeal of products like the Adrenaline drive.